I hold a quarterly dog guide group at Blind Service Association in Chicago. Recently, our guest speakers provided an informative presentation on getting the assistance you need to make your way through the airport. Whether you are using a dog or a cane, it’s great to know about the support available when you travel. Here are some highlights from our meeting. Fifteen dogs were in attendance at our February quarterly Dog Guide meeting. All of the dogs were awesome and extremely well behaved! Our guest speakers from the Transportation Security Administration (TSA) were very giving of their time and didn’t mind one bit that half of their audience was snoring under the table (grin). PSS is a special TSA program offering support services to travelers with disabilities and medical conditions. The Passenger Support Specialist (PSS) person is a TSA representative who has volunteered to provide this service. These volunteers must have a deep understanding of disability, such as having a friend or family member with a disability who they have known and interacted with. They can definitely provide special accommodations such as a sighted guide through the airport and assistance at security screening. To arrange for support, you should call three days in advance of your travel day. When you call the number, you will be able to talk directly with the actual PSS volunteer who will be your guide. You can make arrangements of exactly when and where you will meet up and if necessary, the guide can help you find a relieving area for your dog or facilities for yourself. The toll free TSA Cares Help Line is 855-787-2227. TSA Cares is also an additional dedicated resource specifically for passengers with disabilities, medical conditions or those who need to prepare for airport security screening. Please, come join us May 12th for the next BSA Dog Guide meeting where we’ll be discussing access issues with our guest speaker from the Chicago Commission on Human Relations. Everyone is welcome, regardless of what school your dog is from or if you’re just in the “considering a dog guide stage.” RSVP by May 10 to Pam Berman by email or phone: 773-671-6624. 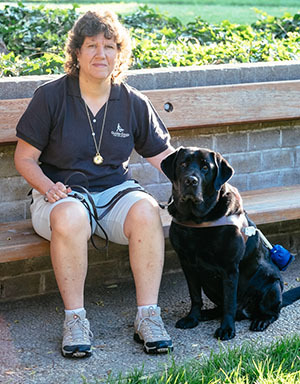 Pam facilitates a dog guide group at Blind Service Association in Chicago and is also Outreach Alumni Representative for Guide Dogs for the Blind. Pam and her guide, Cabrillo, travel the Chicago metro area raising awareness about guide dogs and other advocacy issues.